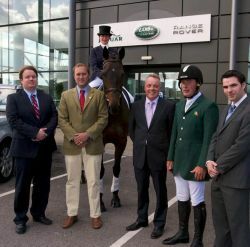 We are pleased to announce joining of Johnson & Perrott Land Rover with the Ballindenisk International Horse Trials 2011. The Johnson and Perrott Land Rover International Horse Trails 2011 is at the top of international eventing calendar in Ireland and now the world, with 160 entries from 11 countries. We will have some of the best competitors in the world competing for 4 days at Ballindenisk House, Watergrasshill Co. Cork. There will be 6 international classes during the event with nearly 40% of the competitors from abroad giving the competition a real international feel. Zara Phillips – Former World and European Champion. Michael and Patricia Ryan - Ireland most successful eventing team, having competed at European, World and Olympic Championships. The Johnson and Perrott Land Rover Challenge at Castlemartyr Resort is an invitational warm up dressage competition for the top competitors for a winner take all €1,000. This is being run in the afternoon of Tuesday 13th September. The CCI competitions start with Dressage on the Thursday & Friday 15th -16th September, on Saturday 17th will be Crosscountry day with the thrills and spills of the biggest crosscountry track in Ireland. The final day Sunday 18th will see the Showjumping and prize giving.